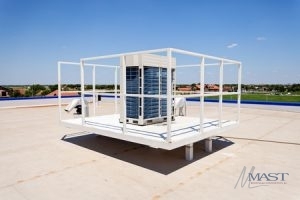 The Mast Roofing and Construction, Inc. are commercial roofing contractors, who are professionals in superior TPO roof constructions for commercial buildings. TPO roofs have evolved into a popular roofing material utilized by office buildings for the last couple of years, partly because of how energy saving, durable, and cost-effective the product is. The roofers at our company are knowledgeable in TPO roof installations, repairs, and examinations, that are able to guarantee that your commercial building has better protection and a great working roofing system. We can attach TPO roof to your commercial building by contacting us now 610-689-3737 to schedule a consultation for longstanding and superb TPO roofing installation in Oley and Philadelphia, PA.
TPO roofs become more common with each passing week. Search no further than the material's exceptional energy efficiency to grasp the reason for this. The lessening of the burden on a property's cooling systems demonstrates the desirability of energy efficiency. This attains two valuable goals: it saves expenditures on your periodic bills, and preserves the usefulness of your air conditioner. Most commercial structures are very big, which makes energy efficient roofing systems even more important. The manufacturing process of TPO roofing ensures assorted characteristics, such as the taking in of warmth in cool weather and reflection of warmth in hot. This keeps both employees and customers happy, and helps regulate your building's temperature. A TPO roof is also flexible, strong, and budget-friendly. For any commercial roofing needs, TPO's beneficial qualities make it a superior solution. Should you want a roofing system that creates improvements for the whole of the structure, call our team today at 610-689-3737. Add Energy Saving Benefits to Your Roof with a TPO Roofing System. The expert roofing contractors at Mast Roofing and Construction, Inc. are committed to providing office structures with superior TPO roof installations. No matter if you are looking for skilled TPO roof constructions from our knowledgeable roofers or want repairs on your commercial buildings TPO roofing, we can handle every task. Client satisfaction is a huge goal for our roofing company, and we can achieve that with correct constructions performed by one of the certified roofers. Our group of roofing contractors are here to help you improve the standards of your Oley and Philadelphia, PA commercial building with qualified TPO roofing constructions; what you need to do is call us at 610-689-3737 to set up a consultation. Updated on April 6, 2018 at 3:17 pm by Mast Roofing & Construction, Inc..